15cm Sturm-Panzer 43(L/12) IV "Brummbär"
The 15cm Sturm-Panzer 43(L/12) IV "Brummbär" is a premium Rank III German tank destroyer with a battle rating of 4.7 (AB/RB/SB). It was introduced in Update 1.61 "Road to Glory". The "Brummbär" carries a 15 cm gun akin to that found on the KV-2 (1939). Due to its long reload and decent armour, this machine is suited to ambushes or supported urban combat. Its ~100 mm frontal armour is a force to be reckoned with (being about the same as a Tiger I's). However, its sides are weak (as any Panzer IV is) and its rear is as well. Its gun has a lot of drop (it is very low velocity), so "sniping" at ranges over ~750m will basically be indirect fire. This is why this vehicle should stick to short-range attacks. Due to the potential of all of its shells, it is almost guaranteed a one-hit knock-out, assuming the shell hits relatively on-target. The vehicle looks somewhat reminiscent of a StuG III, but with a taller superstructure and a much larger gun. It is based on a Panzer IV chassis, but has wider tracks to compensate for the greater weight. It comes with side skirts, but they are mostly useless. Ammo racks for the Brummbär. If in a large, open map, move with a teammate as the Brummbär will not be able to fire at enemies from long range due to the nature of the gun. Urban combat is probably where this vehicle does best, as its armour can bounce many shots if it peeks around corners properly. The short "ideal" range of the gun makes short range urban combat its friend. This coupled with lots of cover for the long reload makes the city the best place to play this tank. Be wary of fast-moving vehicles, as, they are harder to hit with the slow, heavy gun, and especially since the Brummbär does not have a turret, they will flank easily. In addition, heavy SPAA will ruin the Brummbär's day if they get to even the side armour, being relatively thin for its rank. Regardless, most guns of the rank can penetrate the Brummbär frontally from medium ranges, so be careful. Always beware of multiple/squad enemies, as the Brummbär cannot engage them all at once. Sometimes, if they don't see the vehicle, it's better to just let them go and avoid exposing the Brummbär. 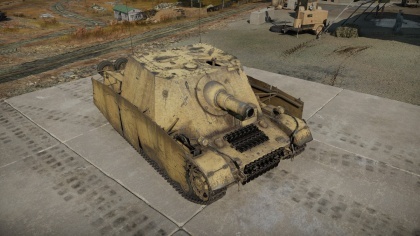 15 cm gun can one shot most other tanks at its BR, and, with proper technique, can one shot most tanks in the game. Very slow traveling rounds, hitting moving targets at range can be extremely difficult. Optic only provides aiming marks up to 800 meters, aiming past that is either in 3rd person view or guestimations. The Sturmpanzer is a development of the Wehrmacht on the needed for a heavy assault gun to provide direct fire support for the infantry in urban areas. It took a Panzer IV chassis, turned it into a casemate structure, and added a 15 cm StuH 43 howitzer (derived from the 15 cm sIG 33) onto the vehicle. 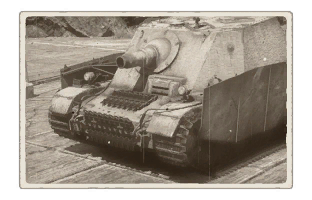 The official names were "Sturmpanzer", "Sturmpanzer 43", or the "Sturmpanzer IV", however it was not known as the "Brummbär" by the Germans as that name was actually coined by the Allied forces. The Wehrmacht accepted it in 1943 and about 300 units were built from 1943 to 1945. The Sturmpanzer was heavily armoured and equipped with a gun capable of leveling buildings. The 15 cm howitzer has 38 two-piece rounds available in storage, though rate of fire is low due to the heavy weight of each shell, the HE shell weighing around 38 kg (84 lb.) alone. Though its armour ensures great survivability, the heavy weight of the design stressed the chassis and breakdowns were frequent on the transmission and suspension. The Sturmpanzer underwent four different designs during its production life, mostly fixing problems experienced with the preceding models. The first series were produced from April to December 1943 with 52 from Ausf. G chassis and 8 from Ausf. E and Ausf. F chassis. The second series of vehicles began in December 1943 using the Ausf. H chassis until March 1944 with improvements to the driver's compartment, internal ventilation, and steel-rimmed road wheels. The third series of vehicles lasted from March to June 1944 with to the driver's optic and a lighter 15 cm StuH 43/1 howitzer as the armament. The fourth and last series from June 1944 to March 1945 featured the chassis and engine of the Ausf. J model, it had a redesigned gun collar, a reduction in overall height, and a ball mount for an MG34 in the front casemate structure. The Sturmpanzer was equipped in four independent battalions in the course of the war in the Sturmpanzer-Abteilung 216, 217, 218, and 219. The first to receive the Sturmpanzers was the 216th in April 1943 with about 45 vehicles split into three companies with 14 each and 3 in the battalion headquarters. They saw use in the Battle of Kursk in Operation Citadeland was assigned to Panzerjäger Regiment 656 in the 9th Army of Army Group Center. It stayed in play all the way to December 1943, assisting German soldiers in attacking and withdrawing from the Russian front. The battalion was transferred in February 1944 to counter the Allied invasion of Italy. Though intended to attack the Allies at the beachhead, the operation failed and the battalion was stationed there all the way until Germany's surrender. The 217th was made in April 1944 and was stationed in Normandy in early June 1944. They did not see use early in the Battle of Normandy as the Allies and the French Resistance sabotaged the rail network to France and the Sturmpanzers, forced to drive to France, broke down enroute. They did see combat at Caen in August 1944 however, but withdrew to recuperate after suffering major casualties. The 217th also saw combat in the Battle of the Bulge, before retreating due to losses and continued withdrawing until captured in the Ruhr Pocket in April 1945. The 218th started as the Sturmpanzer-Kompanie z.b.V. 218 and was raised in August 1944. It stayed in the Eastern Front and saw combat in the Warsaw Uprising. It continued fighting until it was wiped out in East Prussia in April 1945. A similar unit known as the Sturmpanzer-Kompanie z.b.V. 2./218 was made alongside the 218th, though not much is known except that it went to form the actual Sturmpanzer-Abteilung 218 in January 1945. Though expected to be equipped with 45 Sturmpanzers, it ended up with StuG IIIs instead. The 219th was made in September 1944. In October 1944, it only had 10 Sturmpanzers when Operation Panzerfaust was launched and Germany enters Hungary. It arrived on October 19th when it was no longer needed and was sent to Slovakia for further training and equipping before returning to Hungary to relieve the German troops at Budapest. It stayed until forced to retreat by the Soviets before either being wiped out or surrendering. Today, four Sturmpanzers are known to have survived in intact conditions. Each one is in France, Germany, Russia, and the United States. 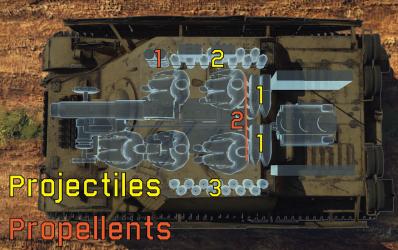 Skin and Camouflages for the Brummbär in Warthunder Live. This page was last edited on 5 April 2019, at 01:03.